Apparently, a pattern is developing with one of our Buff Orpingtons, that she lags behind the group when it comes time to return to the coop for the night. 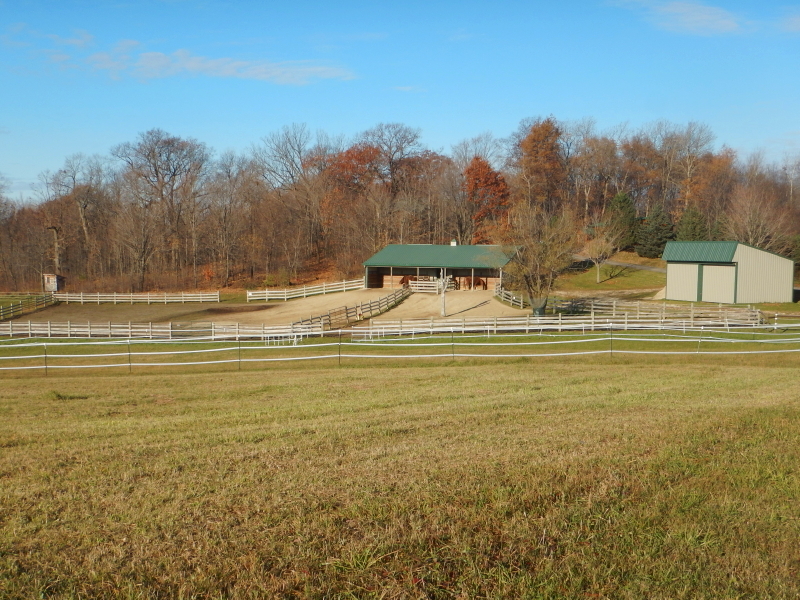 Cyndie describes a funny scene that happened the other night when she was feeding and cleaning up after the horses. 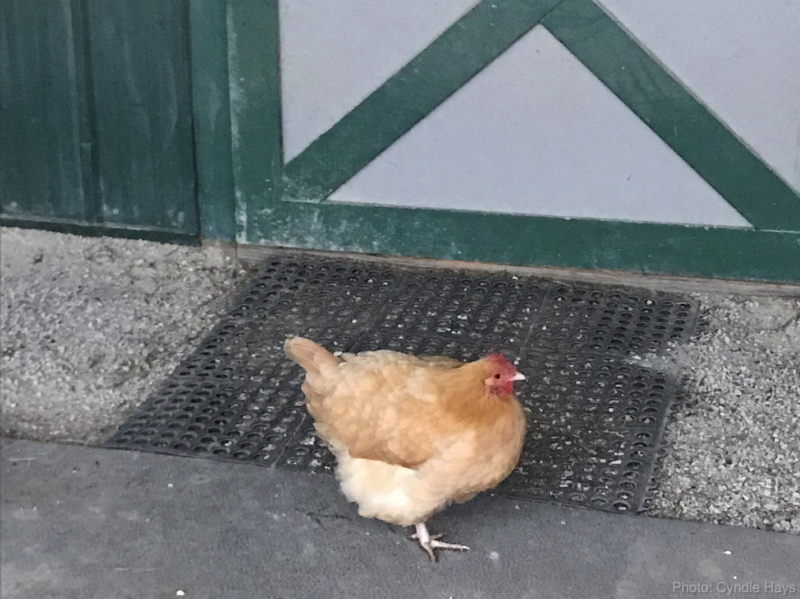 The chickens tend to congregate under the overhang at times, but we don’t want them in the barn, so it becomes an added hassle to navigate the door while going in and out during chores when they are present. Cyndie had shooshed them out, but one Buff stayed after the others wandered off toward the coop. After the sun had disappeared below the horizon, that Buff showed signs of wanting to return to the coop, but acted rather timid about trekking through the snow to get there. 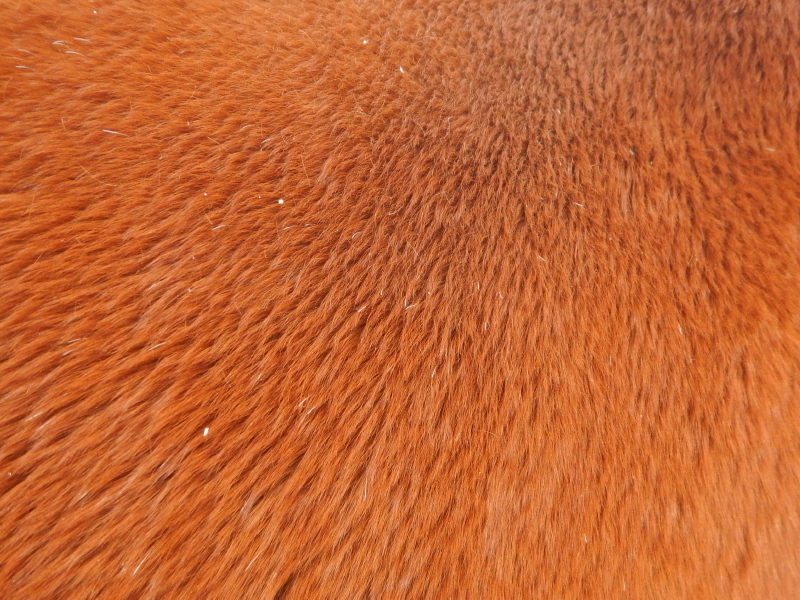 She would get only so far and turn and run back to the preferred confines with the horses under the overhang… several times. Cyndie finally made the trip herself, and had to coax the hen to follow her the whole way. Last night, I went down to shut the chicken door for the evening, and when I got there in the dim light of dusk, it was all quiet, but for occasional sleepy cooing from inside. I spent an extra minute or two clearing the track for the door so it would slide all the way, and that was enough time to give me the feeling all was settled in there for the night. It was a pleasantly quiet time and the fading gradient of orange glow transitioning to blue-black of night on the horizon was gorgeous. I was just about to head back to the house when my conscience urged me to truly confirm all were present and accounted for before leaving. I opened the big door to peek in and counted eight bundles of feathers. Luckily, in the low light remaining, I could tell it was a Buff that was missing. Not thinking of Cyndie’s recent tale, I feared the worst. I had already lingered long enough to know she wasn’t anywhere near the coop. Where would I look for her body, I wondered. I stepped away from the coop, toward the barn, and what do I find? That lone straggler timidly trying to decide if she wanted to walk all the way back to the coop all by herself. Silly bird. I can’t help thinking how sad it would have been for her to finally make it all the way, only to find the door sealed for the night, if I had dashed back to the house without looking inside to count them first. 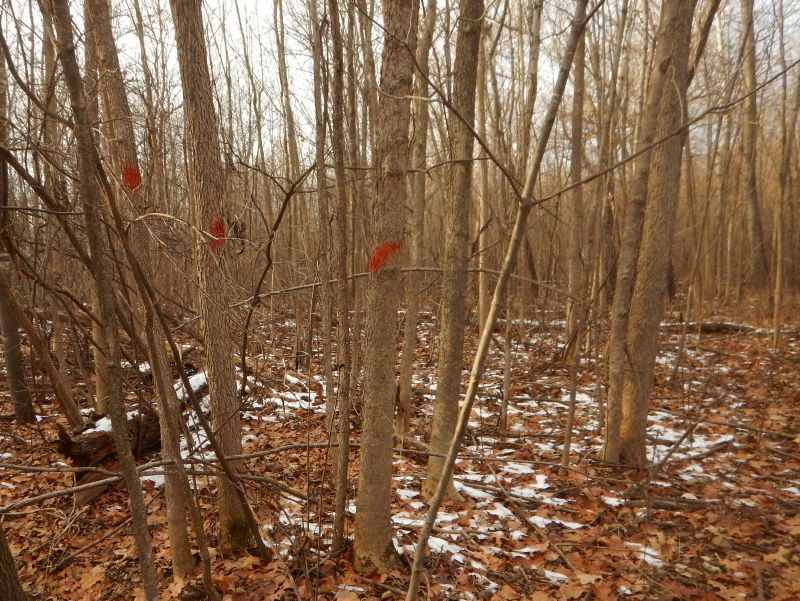 For months now we have been walking past trees in our woods that are marked for removal with a red spot. It was more subtle when the forest was lush and green. Now that there aren’t any leaves on the trees, those red marks are impossible to miss. When our local DNR agent responded to our invitation to walk our woods, we learned our most valuable trees are the oaks, and that they will be kept healthiest if we remove competition growing directly beneath their canopy. I mentioned it would be a challenge for me to identify what is good and what is bad. You know how much of an aversion I have to cutting down live trees. 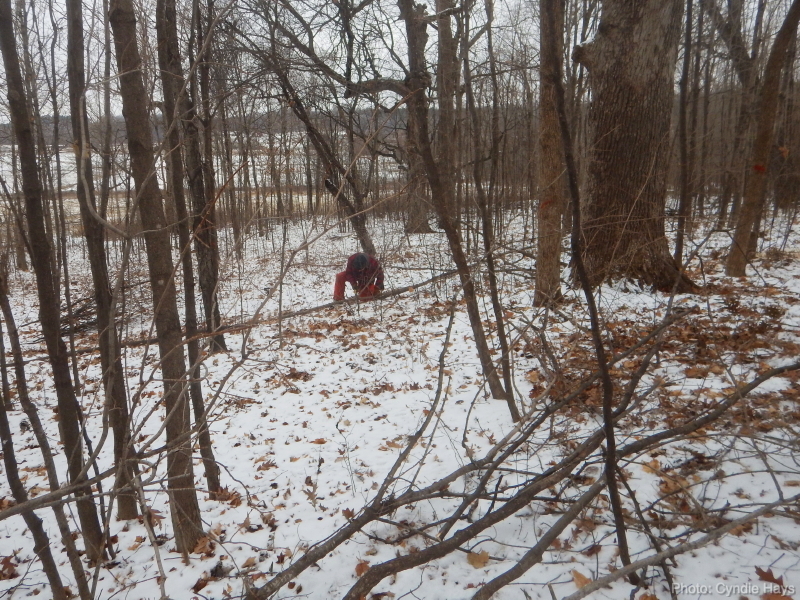 He was quick to volunteer to return later and mark trees for removal. Most of them are relatively small diameter and will be easy to bring down. Cyndie and I decided yesterday was a good time to start on the project. Heck, I can’t drive the tractor anywhere yet, so we may as well create piles of branches to be chipped at a later date. 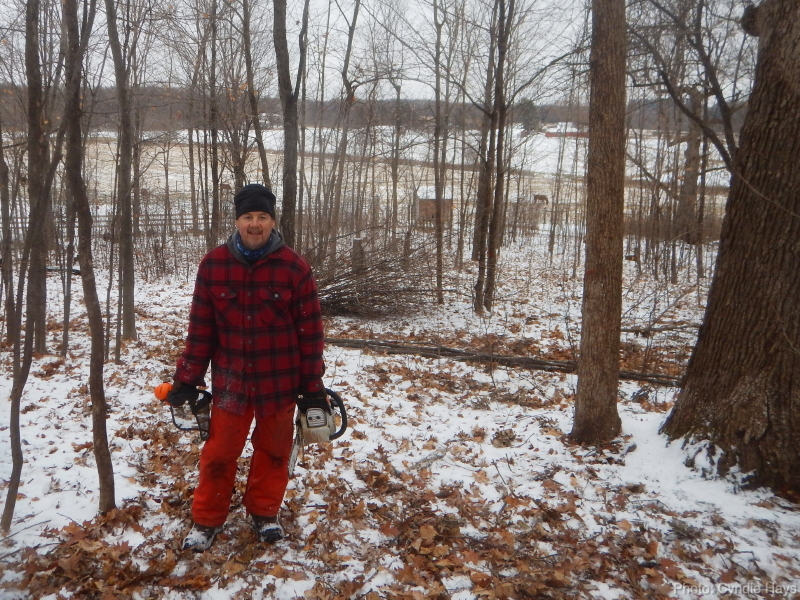 About those red marks… When you get a chainsaw in your hands, suddenly trees with red dots show up at every turn. Maybe that is because I just chose to start with the trees right below the driveway. 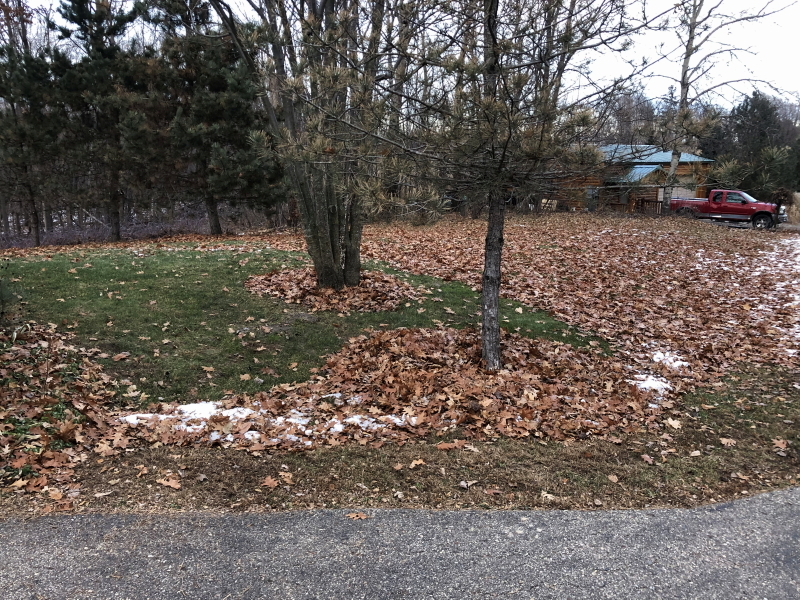 Some of our biggest oaks are right there (hence the thick carpet of leaves that land on the yard) and that meant a lot of trees to be culled all the way around each of the large oak trunks. 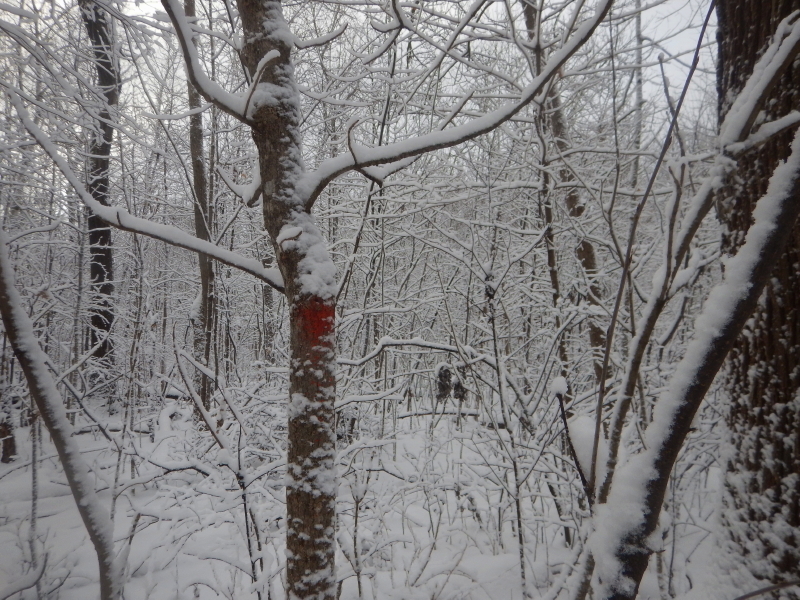 I took some solace in being able to see visible evidence of just the problem our DNR forester described. Oak trees stop feeding lower limbs when other growth begins to encroach from below. That can lead to a lopsided or top-heavy oak. When we pulled down the smaller trees, it was easy to see the number of bottom oak branches that had already been left for dead. Unfortunately, we grew weary after just a couple of hours of cutting up and piling branches of the easiest trees felled. Several substantial sized red-marked trees remain. That will be a project for another day. I may just move on further into the woods where I know there are a lot of small (easy) red-marked trees, before returning to take down the larger diameter encroachers by the driveway. That project will be delayed a little bit now, though, as the more immediate pressing need is for plowing and shoveling snow. We received a decent amount of sticky flakes yesterday afternoon and overnight. It’s hard for me to do, savoring time. The minutes tend to blend, one into another, and days seem to keep passing faster than ones before. It’s a luxury problem to have, I expect. In the face of suffering, perception of time is entirely different. The U.S. holiday of Thanksgiving 2018 is now history. A perceived few minutes ago, I was looking forward to the extra day off from the day-job and gathering with family in the presence of unending food choices. In my quest to tightly manage my sugar intake, the day of feasting becomes an extra challenge. This year, circumstance worked in my favor to give me an assist on controlling temptation to over-indulge. I was in charge of taking care of our animals at home, while the Thanksgiving feast was being held an hour away in Edina, MN., at Cyndie’s parents’ house. The hardest part of the whole adventure for me was, making the choice to slip out surreptitiously while most everyone was still at the table(s), finishing first and second servings, and boisterously sharing stories of various adventures. It went against my every sensibility to not say goodbye, but I didn’t want to cause a fuss and disturb the best part of the day for everyone else. I enjoyed every delectable bite of my sensibly chosen portions of turkey, stuffing, potatoes, giblet gravy, sweet potato, vegetables, cranberry sauce, fruit salad, and Cyndie’s masterful version of my mom’s home-baked buns. A glance at the time brought me to the fateful moment of planned departure. I had an hour-long drive to factor in, and a time of sunset that was firmly determining the end of my equation. I got up from the table with my plate, just as several others before me had done on their quest for seconds, and I disappeared to the bathroom near the front door. Amid the sound of many conversations and occasional laughter, I decided to rely on Cyndie to explain my absence, and I stepped out the front door without a word. In my effort to avoid interrupting the festivities for everyone else, I totally disrupted my sensibilities. Cyndie knew I was leaving as soon as I finished eating, but I had neglected to say anything to others, including my own children. It was a very disconcerting feeling for me to so abruptly depart, but it did save me from facing the decision of how I would avoid eating too much pie for dessert. Happily, the drive was efficient, despite a surprisingly heavy amount of traffic on the interstate, and the animals were all safe and content when I arrived home. 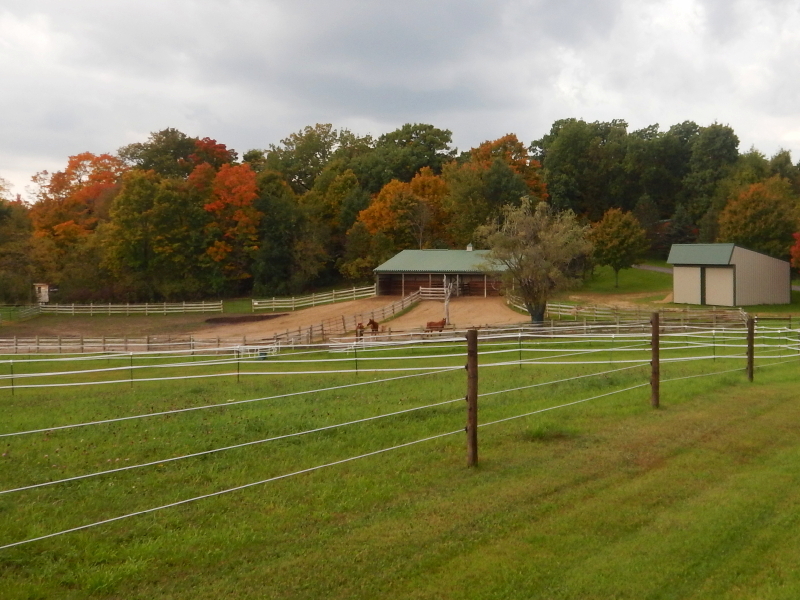 One of the horses was lounging on its side in the paddock while the other two stood watch right beside. I counted the chickens as soon as I could, because Cyndie reported seeing a badger walking toward their direction from the corn field north of us on Wednesday, as she was leaving to spend the night in Edina. She said it turned around when she stopped and opened her door. It’s a privilege to have these animals to care for and I want to savor the pleasure they bring, despite the complications of added responsibility. I’m framing the way they altered my Thanksgiving holiday as a feature, not a flaw, since it helped to limit my calorie intake to a lower level than I imagined possible. It’s certainly not something I would have accomplished left to my own control, if I’d been given a full day’s access to all the flavors available to savor. Some chores don’t wait for a time when I actually feel like doing them. 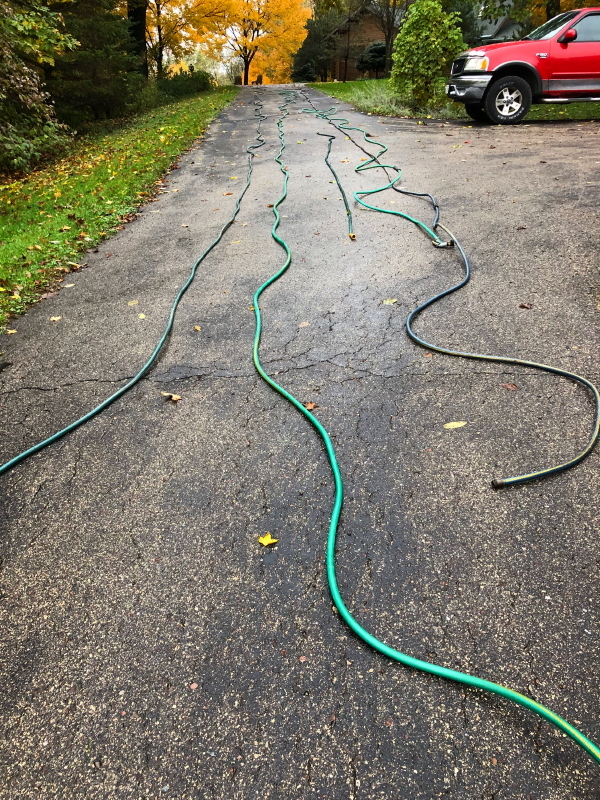 Draining hoses is one of those chores. Of course, who decides to coil up their garden hoses when it is warm and sunny outside? Not me. It would be a treat to do it while the hoses were still pliable. That’s never been my experience. More often than not, I let the chore wait until the forecast suddenly predicts sub-freezing temperatures for the coming night. Yesterday, that led to my needing to wrestle stiff coils in the damp and chilly fading daylight after I got home from work and tended to the animals. Can you say, long day? Delilah was very patient and stayed out with me while I worked, even though it pushed back her dinner to a later than normal hour. It demonstrates how much she treasures being out with us on a task. It is distinctly different from going for a walk. She totally understands we are ‘working’ on something. 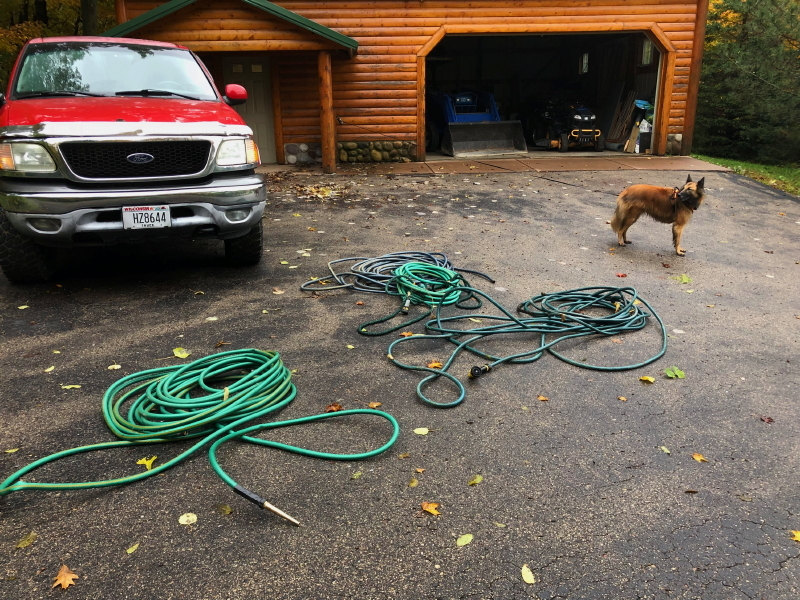 We walked to the different locations where the hoses were being used, and after dragging each one back to the shop, she would look up at me to determine if it was time to go in the house, or if we were setting out after another hose. 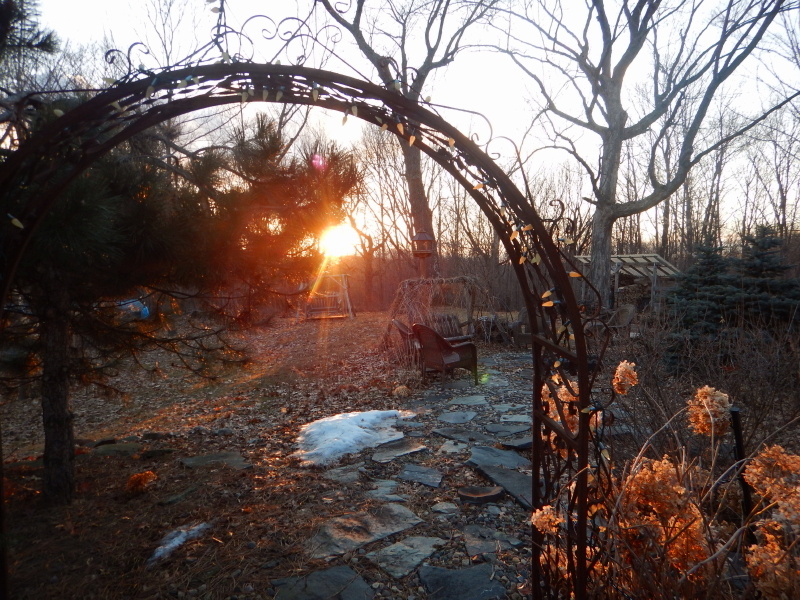 After letting her in the house to have dinner, I stepped back out before it got dark to bring the air compressor up so I could blow out the buried water line that runs down to the spigot at the labyrinth garden. With that chore accomplished, the only task left in preparation for serious freezing temperatures is to pull the pump and filter out of the landscape pond. I’m not worried about that for this first freeze tonight, because that water is moving and is unlikely to lock up with this first, brief dip below 32°(F). For this night, we are now prepared to experience the possible freeze worry-free. I think I’ll be a little disappointed if it doesn’t end up actually happening.